Below you can find a selection of some of the comets and asteroids we imaged in the month of September 2011 using the Faulkes (F65 & E10 MPC codes), New Mexico (H06 & H10 codes) and Malina River Observatory, Italy (B90 code) telescopes. Stacking of 9 R-filtered exposures, 120-sec each, obtained remotely, from the Siding Spring-Faulkes Telescope South on 2011, September 20.6, through a 2.0-m f/10.0 Ritchey-Chretien + CCD, shows that fragment b of comet 213P is still visible, albeit very faint and diffuse (m2 about 21.5, coma diameter about 5-arcsec). Fragment b was located about 5.7 arcmin in PA 240 respect the main nuclear condensation of 213P/Van Ness. During the same observing session, we noticed also the presence of a new fragment, not visible on our past images obtained with the same set-up (the last of which dates back 2011, Sep. 2.5): this additional fragment (that we called below "part-y") appears slightly brighter and compact than 0213Pb itself (m1 about 21.0, coma diameter about 4-arcsec elongated toward the southwest). "part-y" was located about 4.5 arcmin in PA 239 respect the main nuclear condensations of 213P/Van Ness. 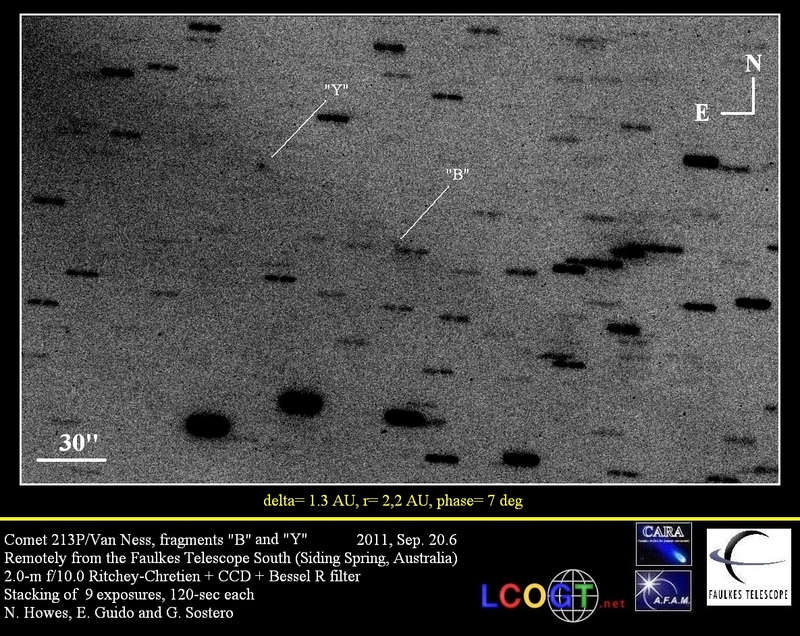 We obtained additional follow-up through the same instrumentation on 2011, Sep. 21.6, confirming the existence of both fragments b and "part-y". Further inspection of our images, exclude the presence of other fragments brighter than magnitude R about 22, up to 12-arcmin tailward of 213P. 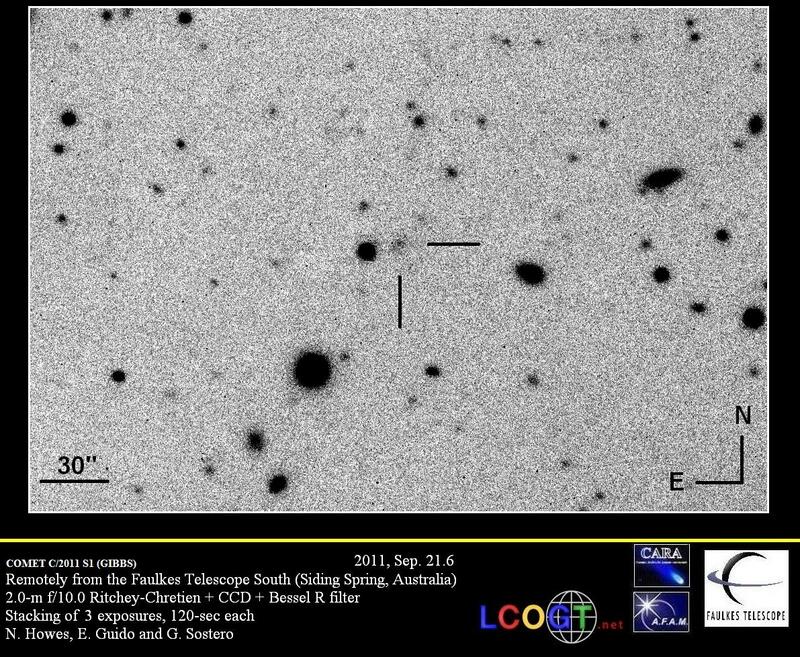 Stacking of 11 R-filtered exposures, 120-sec each, obtained remotely, from the Siding Spring-Faulkes Telescope South on 2011, September 23.6, through a 2.0-m f/10.0 Ritchey-Chretien + CCD, shows that fragment b of comet 213P/Van Ness is now extremely weak and diffused (uncondensed coma about 7-arcsec in diameter) that hampers any astrometric measurement about it (however this might be a temporary disappearance, as sometimes happens with these small cometary fragments in rapid evolution). 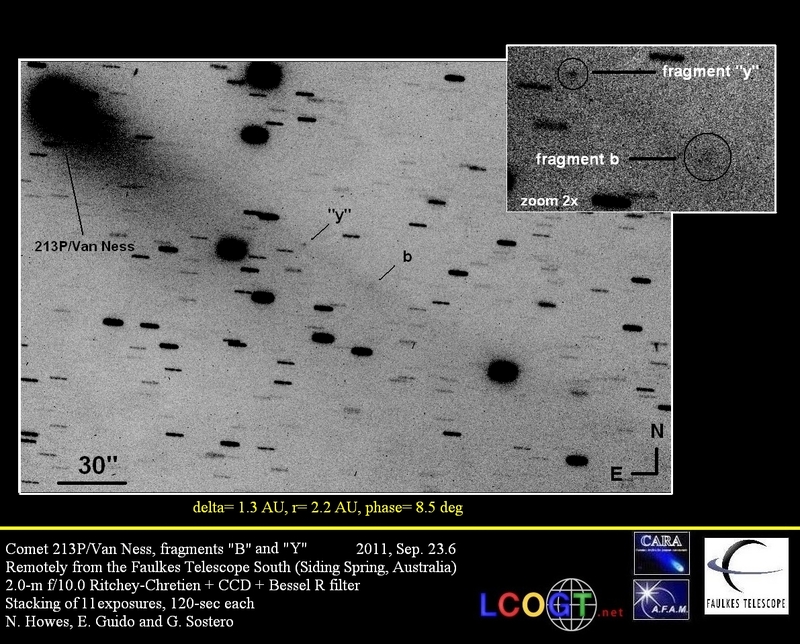 On today's images we found again the fragment we reported first on 2011, Sep. 20.58846 (at that time we called it "part-y"). Cbet nr.2822, issued on 2011, September 21, announces the discovery of a new comet (discovery magnitude 21.2) by A. R. Gibbs on CCD images obtained on September 18, 2011 by Gibbs and S. F. Tornero with the Mt. 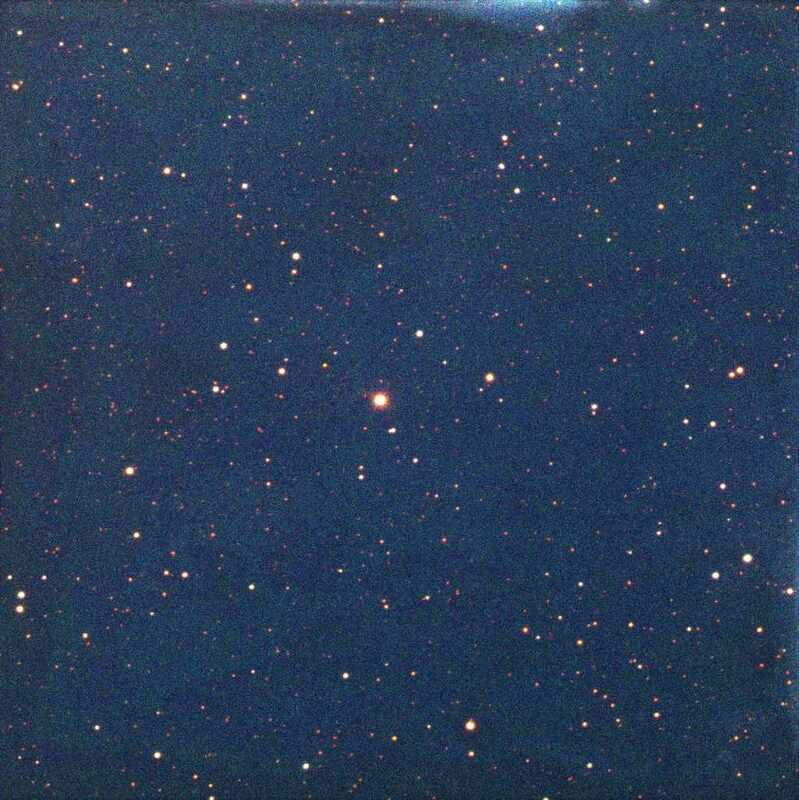 Lemmon 1.5-m reflector. The new comet has been designated C/2011 S1 (GIBBS). 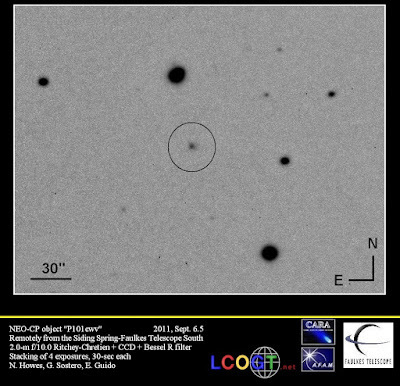 We performed some follow-up measurements of this object, while it was still on the neocp, with "Faulkes-Telescope South" on September 21, 2011. 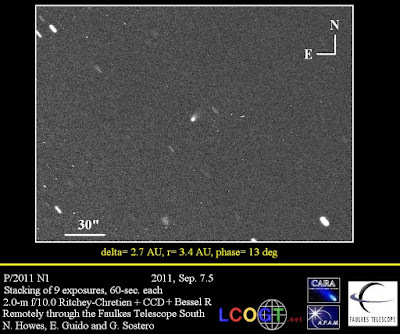 Stacking of 3 R-filtered exposures, 120-sec each, obtained remotely, from the Siding Spring-Faulkes Telescope South on 2011, September 21.6, through a 2.0-m f/10.0 Ritchey-Chretien + CCD, shows that this object is a comet: diffuse coma nearly 6-arcsec in diameter. 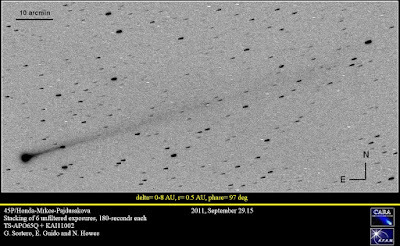 Cbet nr.2812, issued on 2011, September 09, announces the discovery of a new comet (discovery magnitude 18.9) by Artyom Novichonok on six images taken by Vladimir V. Gerke (Moscow) during Sept. 7.02-7.05 UT using a 0.4-m "Jigit" telescope at the TAU station of the Ka-Dar Observatory (located near Nizhniy Arkhyz, Russia). The new comet has been designated P/2011 R3 (NOVICHONOK-GERKE). We performed some follow-up measurements of this object, while it was still on the neocp, with "Faulkes-Telescope North" on September 08, 2011. Stacking of 6 R-filtered exposures, 60-sec each, obtained remotely, from the Haleakala-Faulkes Telescope North on 2011, September 8.4, through a 2.0-m f/10.0 Ritchey-Chretien + CCD, shows that this object is a comet: sharp central condensation, coma nearly 4-arcsec in diameter elongated toward southwest, broad tail at least 7-arcsec long toward PA 252. 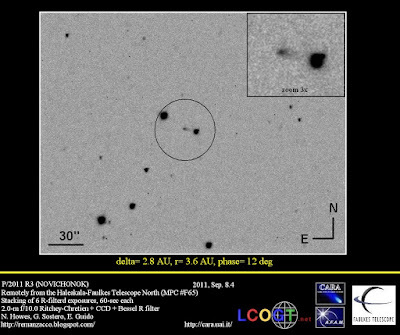 Following the posting on the Central Bureau's Transient Object Confirmation Page about a possible transient in Sco (TOCP Designation: PNV J16364300-4132460) and AAVSO Special Notice #251, we performed some follow-up of this object remotely through the 2.0-m f/10.0 Ritchey-Chretien + CCD of "Faulkes Telescope South" (MPC Code - E10). 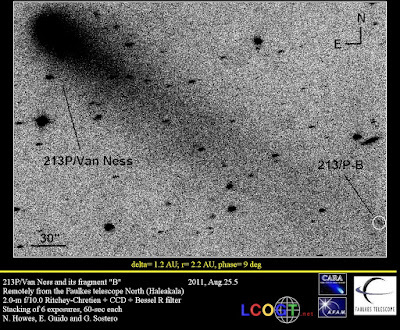 The two independent discoverers of this nova are: John Seach (Australia) and Yuji Nakamura (Japan). According to VIZIER there is a 15.08 R1 magnitude star at 0.060 arcseconds from the transient position (USNO-B1.0 0484-0459316). A. Arai, T. Kajikawa, C. Naka, Kyoto Sangyo University, reports on Cbet 2813 that they performed low-resolution optical spectroscopic observations (R about 580) of this object on Sept. 7.42 UT using the Araki telescope at Koyama Astronomical Observatory. The spectrum exhibits broad Balmer emissions and Fe II multiplet emissions on a highly reddened continuum light. 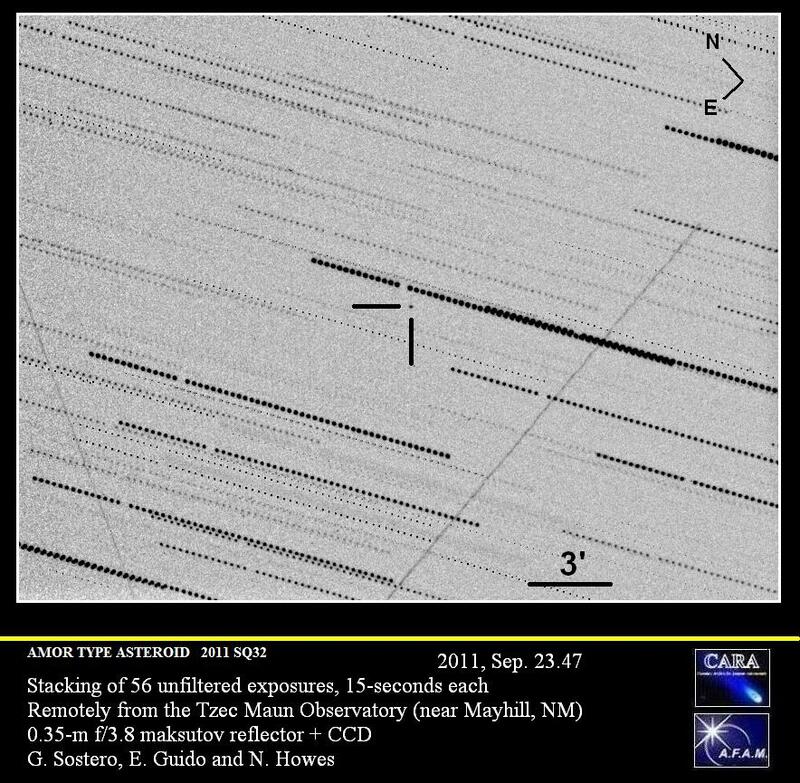 The H-alpha emission line shows an asymmetric profile with FWZI about 6000 km/s. 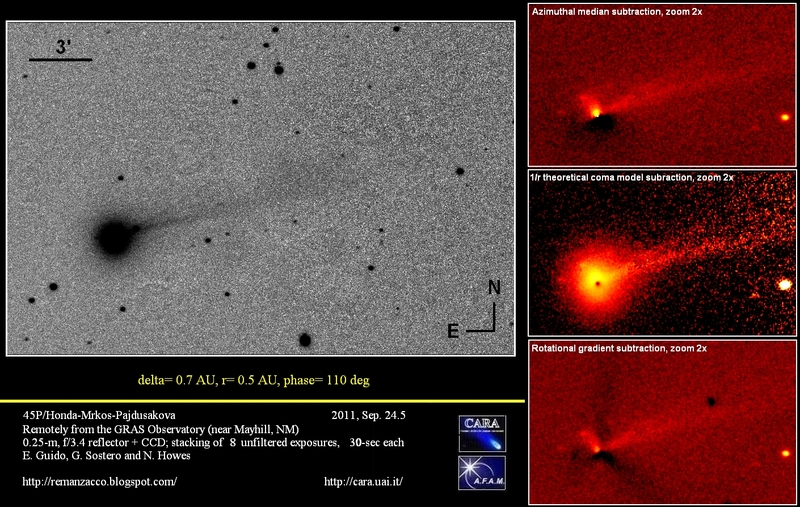 These features suggest that the object is an "Fe II"-type classical nova, highly reddened by the interstellar medium. 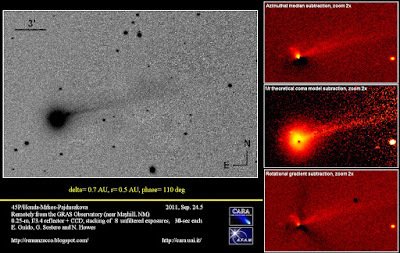 Cbet nr.2811, issued on 2011, September 07, announces the discovery of a new comet (discovery magnitude 18.7) by Larry Denneau and Richard Wainscoat on two i-band Pan-STARRS images taken with the 1.8-m "Pan-STARRS 1" telescope at Haleakala on September 4.5, 2011. 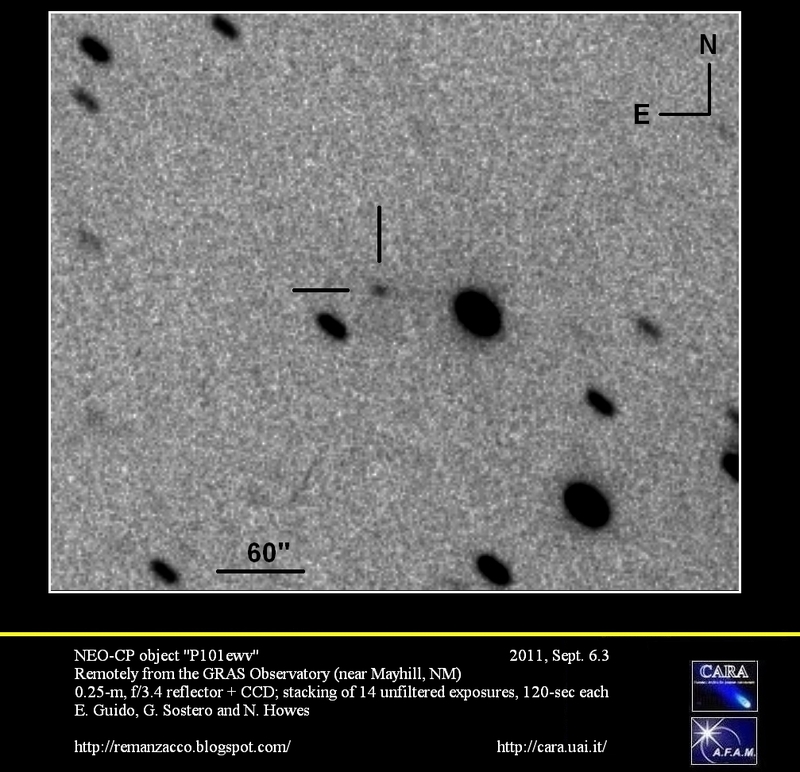 The new comet has been designated P/2011 R2 (PANSTARRS). We performed some follow-up measurements of this object with a "GRAS Telescope" and the "Faulkes-Telescope South" on September 06, 2011. 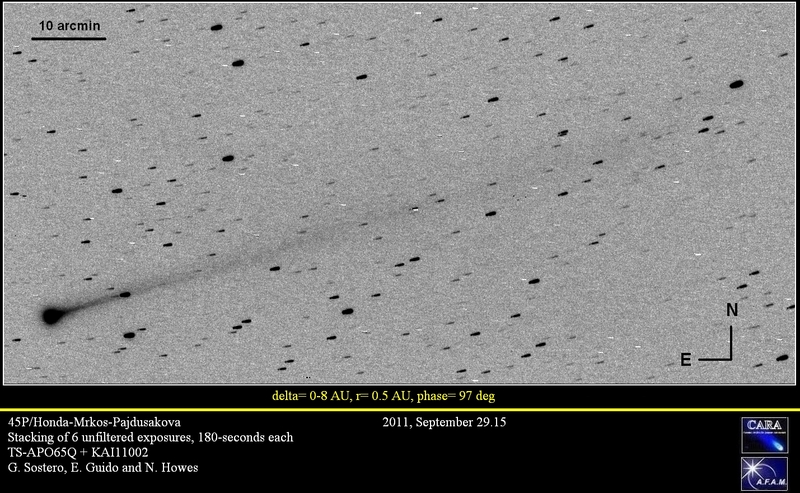 Stacking of 14 unfiltered exposures, 120-sec each, obtained remotely on 2011, September 9.3 from the GRAS Observatory (near Mayhill, NM) through a 0.25-m, f/3.4 reflector + CCD, shows that this object is a comet: condensed coma about 8-arcsec in diameter, elongated, toward PA 250. 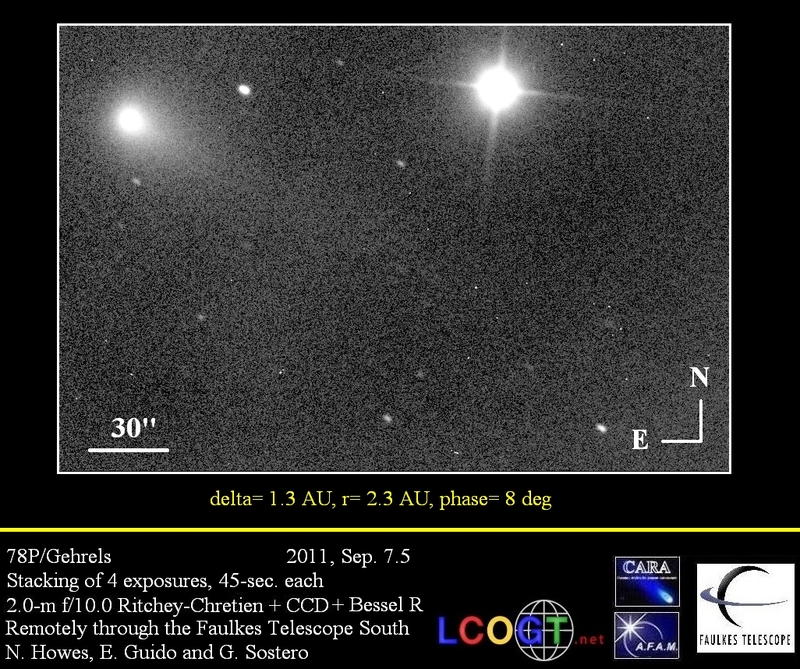 Stacking of 4 R-filtered exposures, 30-sec each, obtained remotely, from the Siding Spring-Faulkes Telescope South on 2011, September 6.5, through a 2.0-m f/10.0 Ritchey-Chretien + CCD, shows that this object is a comet: well condensed coma nearly 5-arcsec in diameter, and a broad tailabout 8-arcsec long in PA 251. 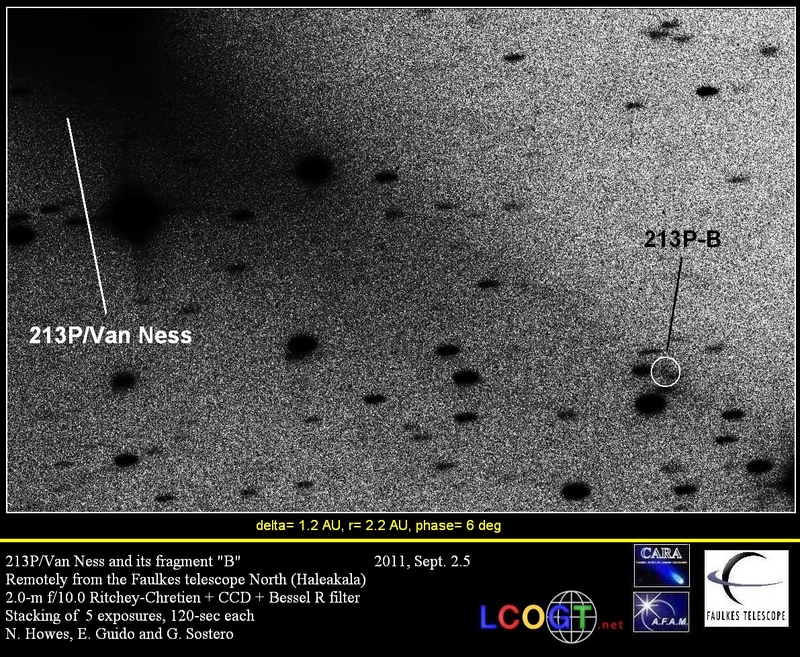 MPECs 2011-P25, 2011-P37 and CBET 2798 detailed the discovery and follow-up about a secondary nuclear condensation (component B) of comet 213P/VAN NESS. Recently we performed some additional follow-up on it, in order to check its evolution. Stacking of eight exposures, 60-sec each, obtained remotely from the Haleakala-Faulkes Telescope North on 2011, Aug. 25.5, through a 2.0-m f/10.0 Ritchey-Chretien + CCD + Bessel-R filter under good seeing conditions, shows that fragment "b" of comet 213P/Van Ness is still present, however now it is very weak (R magnitude about 21) and diffused (coma diameter about 4-arcsec); this hampers any accurate astrometric measurement. 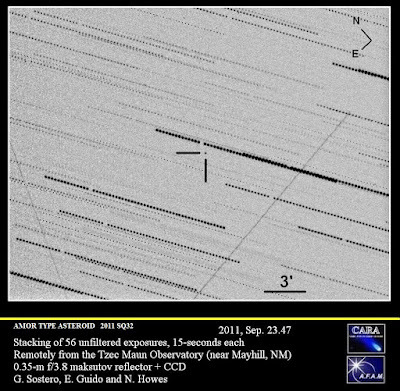 Stacking of six exposures, 120-sec each, obtained remotely with the same instrumentation on 2011, Sep. 2.5, confirms the previous observations, and indicates another decline in its brightness and degree of condensation. The coma has been measured to be nearly 5-arcsec in diameter.